ASTORIA — A coffee-loving couple with dreams of opening their own cafe are getting started early on building a base of loyal customers — by showing up at their homes with free samples. Dennis Lee, 29, and Liz Wick, 30, started Astoria Coffee Delivery, where they hand-deliver samples of their small batch-coffee beans to people in the Queens neighborhood as a way of personally getting to know their future customers. "We just wanted to meet people in the neighborhood," Lee said. "There's the stereotypical high-end coffee shop experience where the baristas are just talking to each other and ignoring the customer," he added. "We totally do not want that." Dennis Lee and his girlfriend Liz Wick are one day hoping to open their own coffee shop. In the meantime, they’re giving the neighborhood a sample of what’s to come by hand-delivering batches of their coffee beans around Astoria. Though their plans for a brick-and-mortar java shop are still in the works, the couple is looking to lease a space somewhere in Astoria this summer with the hopes of opening their doors this fall. In the meantime, they're giving out free tastes of the coffee they plan to serve. They set up a website to take requests from anyone in the neighborhood who's interested, and Lee delivers the beans himself. The couple of eight years has their roots in a coffee shop: they met in a friend's cafe in their hometown of Columbus, Ohio, where Wick worked and Lee was a regular customer. They moved to New York a few years ago, eventually landing in Astoria, where they thought the coffee shop scene could use a few more options. "We saw an opportunity," said Lee, who left his former job making guitars to focus on getting their plan off the ground. Wick works as the manager at a Lasik eye surgery center. Their vision for the cafe is a place with a no-frills vibe, where residents and local artists can feel comfortable hanging out. 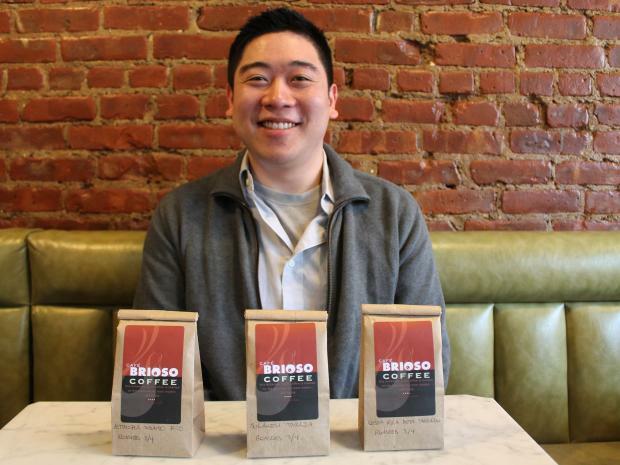 "We want to have specialty coffee without the fuss," Lee said. He says they hope to host events for the community, like live music shows and gallery parties. There would be a separate space for laptop users, with no WiFi restrictions, and they would serve pastries and baked goods, as well as premium loose-leaf teas that customers can buy in bulk. The name is still in negotiation, though Lee says they're leaning toward the simple moniker Astoria Coffee. "We're not trying to be a super-cool, hip coffee shop," he said. "We just want people to have a good experience, and we just want to serve good stuff." 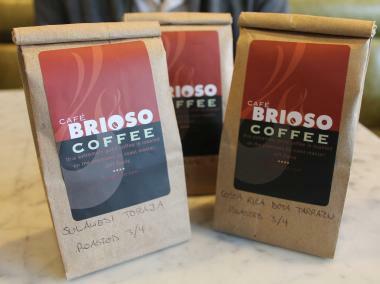 Their coffee beans hail from Cafe Brioso, an artisan roaster based in Columbus. "One guy roasts all the coffee, so we get really consistent roasts," Lee said, saying the feedback has been so positive they've started selling larger bags at the request of their free-sample customers, which sell for $14 to $16 for 12 ounces. "Fortunately, people were really into it," he said. "We're pretty confident people will be back."